What significance does living in the liberated land have on Arman? Arman’s family initially moved there for work related reasons. However, today living in that land means more than just a duty for him to fulfil. 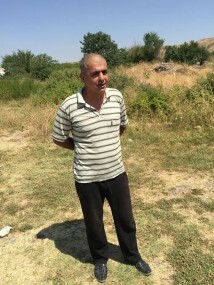 Even though one of his brothers moved to live in the capital, Yerevan, he is still happy that his son is growing up on liberated Armenian land. He is also excited that he personally gets to partake in the rebuilding of these historic lands that our freedom fighters fought to liberate. In 2014, Hayrenaser Organization reconstructed Lernahovit Village’s school and gave the community a newfound hope for a better future. This year the organization is working on reconstructing the school in Vurgavan. Due to lack of a community Health center, the organization is also working toward building one, in addition to a Community Center. All the construction projects are managed by Arman. He says that he considers these projects more than mere job to be completed, and pour his heart and soul into having them completed. He even suggests that the efforts he invests into these projects equate his efforts of building a house for himself. He spends day and night following up on the progress of the construction, reassuring that all details are done professionally and as desired. The construction in Vurgavan is not only a promise for a better future, but has it benefits for the community today. About ten people are employed as construction workers in the village. This jobs allows them to support their families, considering the scarcity of job opportunities which pay cash income in the village. The construction in Vurgavan also benefits economy of the nearby village of Saratak, where the small Pumice Block company is located. Since this is where the construction material is bought from, the company would have been facing closure if it weren’t for the material order made by Hayrenaser. The villagers are very enthusiastic about the construction and often find time to participate in these projects. Even if they are physically incapable, they lend a helping hand in various means including but not limited to, providing shelter, commodities and food for the workers. Even the town mayor, Gevorki, gave one of his sheep to the workers, as a means of showing his enthusiasm and gratitude for their dedication and hard work. The children are also excited about all the building happening around them, even though Arman makes sure no one goes near the construction sites. However, even from afar, they still watch their bright future being build in their birthplace and homeland.